The ONLY thing I respect about these scams is their marketing department. They have the uncanny ability to indoctrinate people into worshipping their scam, to the point where they launch an assault on you if you tell them that they’re propagating a scam. It’s like arguing with a Flat Earther sometimes. I have an extremely fine tuned financial BS detector because I know how the financial and global monetary system works and they are all varying degrees of Ponzi. The common cons are Bitconnect, USI Tech, OneCoin and DasCoin. They are bonafide scams. OneCoin being the worst, USI the least, but they’re still varying forms of Ponzi. They may dazzle you with words like Blockchain and ‘no money down Bitcoin’ etc, but it’s still a gangrene-ridden pig in a new shiny dress. And like any Ponzi it’s great and ‘convincing’ watching your paper profits grow. But when the tap runs dry of new blood…game over. Jut research Bernie Madoff! It was rife in the FX world and the same people are now transitioning into the Crypto space. I have no problems with the MLM industry, but if you ever come across any form of MLM in the crypto space, it’s a scam. The main values for Cryptos is that it’s public, open sourced, decentralised and with no middlemen. A crypto MLM is exactly the opposite! It seems like anyone that has bought Bitcoin instantly becomes a know it all. I met a hairdresser the other day who called herself a crypto expert. After playing dumb and asking some knowledge depth prodding questions, it was evident she wasn’t a font of crypto knowledge…but merely a puddle. 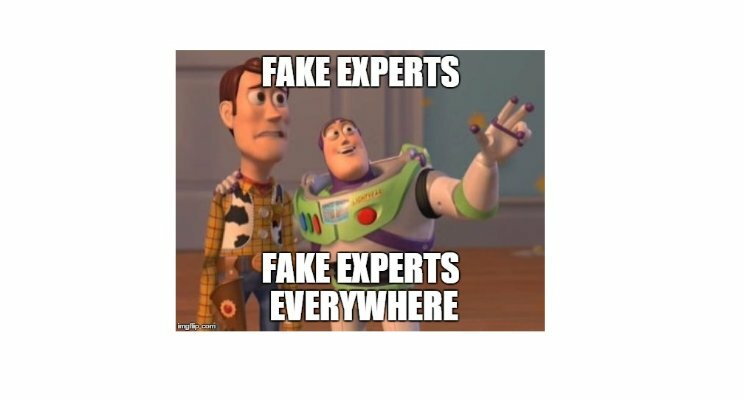 Just because you know how to buy some cryptos or you have joined a crypto cult/MLM does NOT make you an expert. Even if you have made some nice profits or that you bought Bitcoin a few years ago does not make you an expert. It just means you were either lucky or you were clever and forward looking. But what people don’t realise is that Bitcoin is not battle tested yet as it has only existed in a time of overall market (equities/property etc) growth. No one knows for sure how it will act in a depressionary/deflationary environment. Also it’s just in Phase 2 (out of 3) in its cycle. This is the speculation Phase where you ALWAYS see bubbly price action. It hasn’t entered the Established Phase yet and it won’t until the bubble pops. Anyone can become extremely proficient with crypto terms/knowledge after spending 10 hours of intense Google learning. Anyone can do that. However you need 2 key parts to be effective . It’s like an iceberg. The visible part of the iceberg is knowing the crypto mechanics. Knowing how to safely buy, store, sell cryptos. That’s the easy bit. The submerged part of the ice berg is the Investing/Speculating/Trading aspect of it all. That’s something you can’t just pick up from Google. There’s no substitute or shortcut to that experience. This is the part I’ve spent 13 years hard grafting in. I’ve had horrible days in the beginning but I’ve also had days where I’ve made 6 figures. The reason I’m saying all of this is that even though I know more about Cryptos than most and I’m a better investor than most, even I don’t call myself a ‘Crypto Expert!’ To be a true expert in this space it has to be someone who’s a computer scientist/cryptographer/data security expert that ALSO has been a solid investor for many years. So if you have a friend who has suddenly become a Billy Big Balls Crypto God, yet they’ve never been an investor, be very wary of what they tell you! I’m very much in Cryptos and personally believe this is as big to Money as the Internet was for communication, but remember, this sector HAS TO experience a painful bubble popping before it can mature. So ignore the hype and if you do play with it, just use Risk Capital.